Bangalore Political Action Committee (B.PAC) is a non-partisan citizen’s group that aims to improve governance in Bengaluru and to enhance the quality of life of every Bengalurean. B.PAC is specifically targeting good governance practices, integrity and transparency in all arms of the government, improving the quality of infrastructure in the city, identification and support of strong candidates for public office at all levels of governance and the creation of a safer city where the rule of law is ensured for all citizens of Bengaluru as highlighted in B.PAC charter and Agenda for Bengaluru. 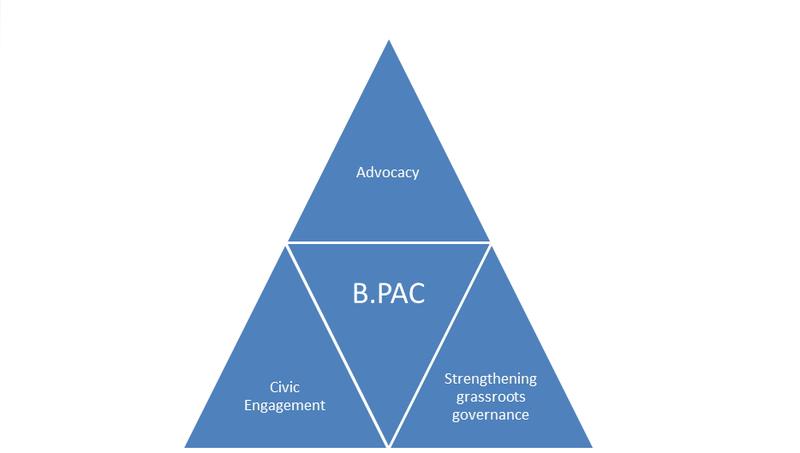 Born of a will to convert urban apathy to positive actionable change, B.PAC has grown into an influential, neutral, apolitical organization that works towards enabling good governance and encouraging active engagement with citizens, civic bodies and the government. B.PAC has emerged as a platform for participative democracy, inspiring informed voting by advocating for a transparent campaign financing, responsible electioneering, organizing pre-election debates and preparing reports of the candidates contesting in elections. To promote governance practices and policies that improve the economic competitiveness, social well-being and inclusive growth of the city. To encourage integrity and transparency in all arms of the government. To improve the quality of infrastructure in the city and meet global standards. To identify and support strong candidates for public offices at all levels of governance–be it city council, legislature, and parliament. B.PAC is indifferent to the political affiliation of candidates and will focus only on their alignment to the specific agenda of B.PAC. To create a safer city where the rule of law is ensured for all. To enhance the image of Bengaluru. Establishing an Agenda for Bengaluru that is inclusive and beneficial to all Bengalureans. Building support for the Agenda by engaging citizens through a steady stream of outreach and communication regarding the same. Engaging with the political leadership of all parties and government officials to help further the Agenda for Bengaluru. Providing financial support to candidates contesting BBMP council seats, the 27 Assembly seats in BBMP areas, and the MP seats from Bengaluru who support the Agenda for Bengaluru. Develop and maintain a program of informing voters about BPAC-supported candidates in elections, and recommend that they vote for them. Espouse legal processes necessary to further the Agenda for Bengaluru. Maximizing people’s participating in democracy by supporting voter registration efforts. Guided by the aim to make Bengaluru a world class metropolis, the organization works on the training aspiring civic leaders, participatory democracy, women and child safety, environment, mobility, heritage protection and advocacy for smarter and effective regulations. The following are the list of programs/initiatives B.PAC conducts to achieve its mission and vision. The Agenda for Bengaluru is a set of initiatives, across the spectrum of government and society, which B.PAC believes will enhance the quality of life for all citizens in Bengaluru. As the objectives are reached, or based on review from time to time, B.PAC may include new initiatives that reﬂect the changing needs of the city. PROPER GOVERNANCE STRUCTURE FOR THE CITY. The policy, planning and administrative efforts of government are inter-twined, as a result of which there is inadequate clarity of roles and responsibilities of the BBMP, state government and Parliament for the city. Reforms and policies that would have greatly improved the quality of life in the city are mandated by the 74th Amendment, the Karnataka Municipal Corporations Act, and the BBMP Act, but are not being fully implemented. Create a statutory planning approach for all aspects of economic and social development, through the formation of a regional planning authority for Bengaluru city. Establish a meaningful term of office for the Mayor of the city, the Corporation Commissioner and key civic officials, such that they have adequate time to develop a vision for the city and implement it. Ensure that the mandates of the 74th Amendment, and the recommendations of the Dr. K. Kasturirangan Committee, are implemented. Introduce legislation as proposed in the Bengaluru Metropolitan Region Governance Bill to strengthen public administration, facilitate citizen participation in governance and enhance the powers of city government. Pushing for key officials in the BBMP (and the parastatals, e.g. BWSSB, BMRTC, BESCOM) to be appointed in time so that there is adequate leadership to meet the city’s needs for development. All parastatals that provide civic services should be brought under a common authority for the city to ensure that BBMP has capacity to administrate the areas of the city. A municipal cadre should be established for the state, and officials in city government appointed from this cadre only. Appoint technical members in the Boards of the civic agencies, and technical advisory groups in each agency that bring in the expertise of private citizens to the regular functioning of service providers. Appointing citizens with necessary expertise in tackling urban problems as nominated corporates in BBMP. Including citizen experts in each of the Standing Committees of BBMP. Forming ward committees in each neighbourhood, thereby involving citizens in routine works at the ward level. The profession tax collected in the city should be earmarked by the State government for the city. 2. 50% of the stamp duties collected on property transactions in BBMP limits should be given to the city. 3. 50% of the road tax collected in the BBMP limits should be given to the city. Such funds can be given either to BBMP, or to the BDA, for infrastructure development. The principle of such use of funds can be applied in all cities in the state, and they would all benefit from the infusion of funds. 1. Public disclosure of expenditure on all projects. 2. Public information on all tenders for works executed in the city. 3. Regular progress reports on all projects. 4. Performance audits of projects undertaken by the officials of BBMP and other parastatals, with scope for citizen feedback. 5. CAG audit of the municipal body each year. 6. A public accounts committee to be created in BBMP to provide continuous improvement in standards for project execution. We need world class infrastructure, if we are to have a world class city. At the moment there are serious deficits in physical infrastructure, knowledge infrastructure, social infrastructure and financial infrastructure, and we must overcome these swiftly. A comprehensive proposal for infrastructure development across all sectors has been drawn up by the Karnataka Information Technology and Communication (ICT) Group, which was presented to the government on January 8, 2013. B.PAC will advocate that each piece of this proposal be taken up by the government and instituted over the next 10 years. Strengthening Urban Representation – Despite the growing urbanisation in the country, the number of seats in State legislatures and Parliament from urban areas has not grown. Thus, we explore legal and political processes to make representations that continuously reflect changing demographic trends. Campaign Finance – The permissible amounts of expenditure for election campaigns is currently too low, and needs to be set realistically. Also, regulation of campaign expenditure is weak. B.PAC will take up necessary interventions in courts as well as with the Election Commission to set realistic limits for expenditure and ensure that these are regulated well, so that the public gets a good view of all candidates before election day. B.PAC’s advocacy of its objectives will be greatly strengthened if large numbers of people in the city are also supportive of it. To this end, B.PAC will work to develop and maintain a public outreach program that provides a steady stream of material to the public to educate them about its objectives and the progress that remains to be made to achieve them. (a) A network of supportive citizens, known as the Friends of B.PAC, will be formed to extend the advocacy of B.PAC into different parts of the city, and in different fora. (b) The B.PAC website will register those who are similarly keen on reforms in the city, and send them regular updates of the work B.PAC is doing, along with suggestions on how they can be co-advocates with us in furthering the Agenda for Bengaluru. (c) B.PAC will partner with organisations engaged in similar work to promote reforms in the city, and take up speciﬁc initiatives. (d) B.PAC will maintain a media outreach program by which material for the media is speciﬁcally prepared and distributed. B.PAC members, in their personal appearances in the media, will also take up the advocacy of the Agenda for Bengaluru. Opp. Vikram Hospital, Bengaluru 560052.